If I haven’t admitted this before, I love having books. I enjoy reading them, but there’s also something about surrounding yourself with lots of books. I think it makes a statement about valuing the written word. I frequently go to yard sales and book fairs, searching for old books that I can buy for a quarter or 50 cents. This past Christmas, my wife surprised me with an Amazon Kindle Fire. She uses it much more than I do, but in theory, at least, the thing is mine. 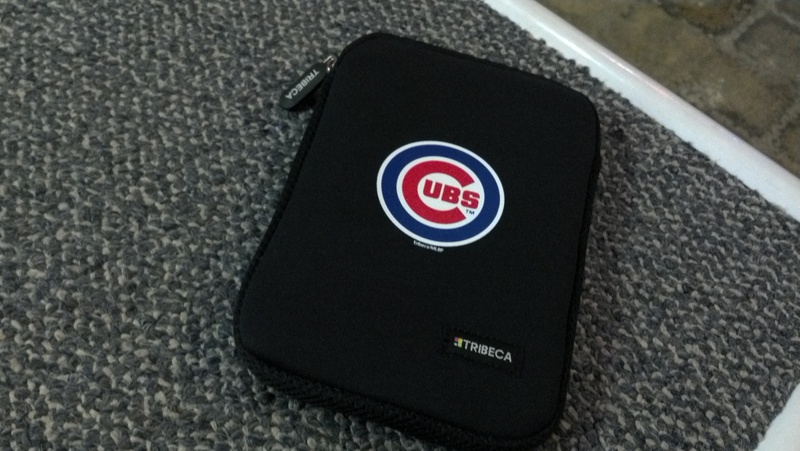 I even have a Cubs carrying case for it, and I took a picture of it when I was out on New Year’s eve. If I can carry it around without losing it or crushing it somehow, I think it will be a great thing to have. But what does the proliferation of tablets, and e-readers, and smartphones that allow you to download and read books, mean for books in the future? For starters, it means that books costing $20 or more can now be purchased digitally for several dollars less. Which option are most readers going to choose? I know the answer to that, and you probably do, too. Physical books, as we have known them all our lives, have been in a downward spiral for a few years, at least. I work in publishing, and there aren’t any growth opportunities in this field. Digital publishing, yes, but books themselves are moving the way of carbon paper and pagers. But books should be different, you might say. Ever since Gutenberg and the Renaissance, people have had a kinship with their books. And I fully agree with that. However, people’s need to read will adapt to whatever form the material is presented to them. Books will always be one of those formats, of course, but digital is also coming into view as an appealing alternative. This is all being fueled, of course, by the internet. Isn’t that how you’re reading this, after all? The internet has made photographs obsolete, has brought the Postal Service to its knees, has put many booksellers out of business, and has turned analog forms of recorded music into relics. The diminution of the printed word–consisting of ink on paper with binding and a nice cover–is another logical step along this progression. Whether or not it’s actually “progress” is open to discussion, but it is happening, and will continue to do so. The final frontier in this process is school textbooks. My children now lug an inordinate amount of paper to school with them each day, and a tablet that can be used to present all this material to them–and to make it come alive for them in a way that textbooks cannot–is something that almost needs to happen. As digital content changes our everyday lives, it seems foolish to require that children remain burdened–literally as well as figuratively–by these behemoths. Once tablets become cheap enough that schools will buy them, instead of bulky textbooks that will become outdated in two years, this evolution–revolution, really–will be complete. And like smoking indoors, it will only take a small amount of time before we wonder how we ever got along any other way.